I heard somewhere that eating lentils on New Year’s Day is supposed to bring you wealth and luck in the upcoming year, vitamin so I did a little poking around. Wikipedia confirms that this is in fact a tradition on the island of Malta, capsule and the tradition goes all the way back to Roman times. Does it still count if you eat them just a few days after New Year’s Day? I think so, drugs but if I’m wrong at least lentils are as tasty as they are good for your health and wealth. For a really healthy mid-week dinner, I simmered French lentils with sauteed carrots and onions and spiced them up with Madras Curry Powder. A little lemon and olive oil and you’ve got a beautiful base for grilled fish. The Mahi fillets were marinated all day in olive oil, soy sauce and mustard seeds, which makes for a super moist fillet with a little bite to it. A perfect way to ring in the New Year and hopefully bring a little luck to your 2009. Any sturdy white fish, like halibut, sea bass or even salmon would work well instead of the Mahi. Marinate the fish by adding the olive oil, shoyu and mustard seeds to a container and mixing well. Add the Mahi, making sure each piece is evenly coated, then cover and refrigerate for at least 2 hours (I left mine for about 12 hours). To make the lentils, place a medium-sized pot over medium heat and add 1 tbsp. of olive oil. Once it’s hot, add the onions and carrots and saute until soft, about 10 minutes. Add the lentils, stock and curry powder and bring back to a simmer. Cover, reduce the heat to medium-low and let simmer for 35 minutes, or until the lentils are tender and the stock is absorbed. You may need to add another half cup of stock if it is absorbed and your lentils are not yet tender. Remove the lentils to a bowl and stir in the salt, lemon zest, lemon juice and the remaining olive oil. Taste and add more salt or lemon juice if needed. Set aside and let come to room temperature. Preheat your grill (or grill pan, or broiler) to medium-high heat. Once it’s hot, place the Mahi fillets on the heat and close the lid. Let each piece cook completely undisturbed for 5 minutes on each side. Your fish is done when it’s opaque the entire way through. Place a little heap of lentils on 4 plates, then top with Mahi. Serve immediately. 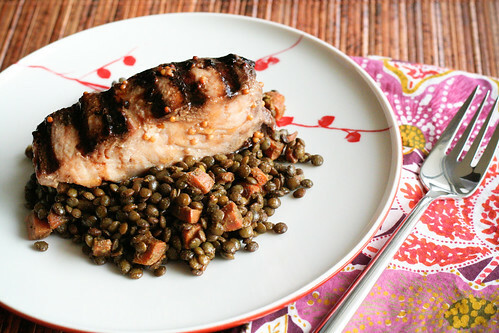 curried lentils are one of my favorite things ever and the mahi looks spectacular. now i’m excited about dinner this weekend!